While we may not seen much of her on the carpet, Rosie Huntington-Whiteley is definitely serving looks via instagram. She posted another winning look to her page on yesterday(January 29th). 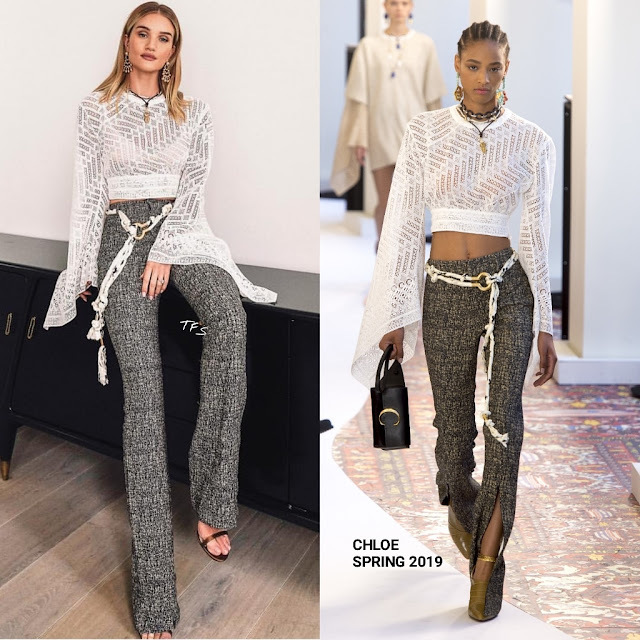 She posed for the gram wearing an CHLOE SPRING 2019 ensemble which featured a white cutout knit crop top with handkerchief sleeves and grey, belted waist trousers, with split legs. Although she may not be standing completely, it's still not hard to tell how chic she looks here. The necklace which is also from the runways look, was unnecessary but I still like this. NIKOS KOULIS earrings, and center part tresses rounded out her look. Are you feeling Rosie's instagram style as well?